Rev. Sigurd Petersen had left Emmaus in June, 1954 to accept a call from the Parsons State Training School in Parsons, Kansas. He was succeeded in January, 1955 by Rev. Thorvald Hansen. In addition to pastoral duties at Emmaus, Hansen was intensely involved in the 1960 merger of the various ethnic Lutheran synods into the American Lutheran Church. In 1964, at the height of the Baby Boom, Emmaus hired its first full-time Assistant Pastor, Rev. 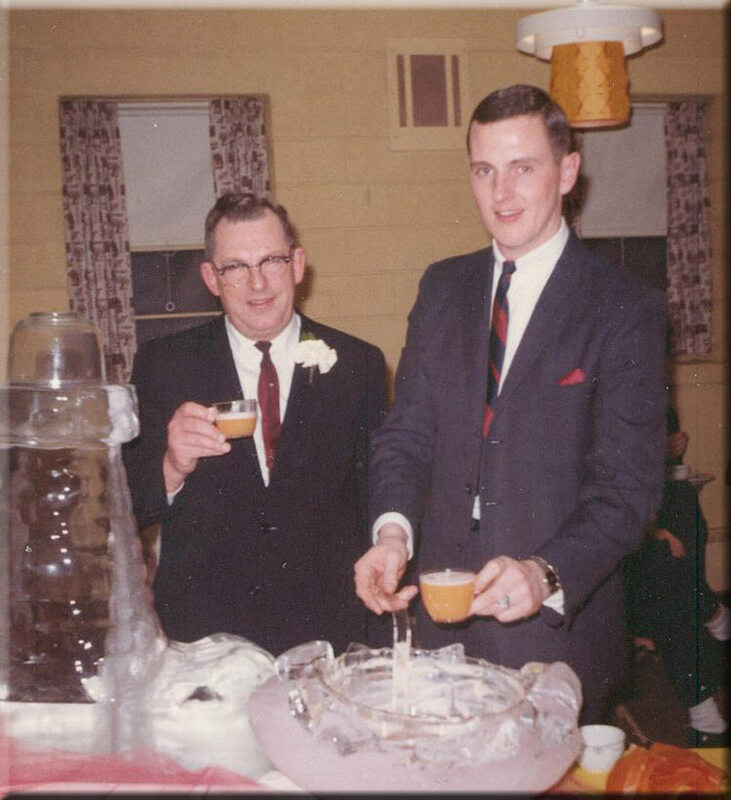 Philip N. Knutson (pictured at right with Rev. Hansen), who served Emmaus until the summer of 1966. Rev. Knutson went on to work as Assistant Director for Campus Ministry at the ELCA offices in Chicago; upon his death in 1994, the Philip N. Knutson Endowment was established for the purpose of funding programs, conferences, and exhibits related to timely life issues facing Christians in higher education. Every four years the conference is directed to focus on the subject of human sexuality and the church. In May, 1966, the congregation paid off the mortgage on the new church building. Pastor Hansen accepted a call to a new church in Audubon, Iowa in 1969, and was succeeded at Emmaus by Rev. Luther Borgen. Rev. Borgen was succeeded in 1972 by Rev. Kenneth Carlson. Rev. Borgen passed away in 2001.During Carlson’s term, Emmaus extended a call to its first pastor of non-Scandinavian ancestry, Rev. Alan Goertemiller, to be Associate Pastor. He served from 1974 to 1978; he retired from the ministry in April, 2016. The other Associate Pastors during the Carlson pastorate were Rev. Kenneth Halstead (1979; currently in Waseca, MN) and Rev. Jeffrey T. Wild (1980-83; now at Advent Lutheran Church of Madison, WI). Emmaus sponsored a family of refugees from Vietnam in 1975. Mai Dac Hoang, his wife, Nguyen Thi Sam, and their five children fled Saigon as the South Vietnamese government fell. Of the seven, only eldest son Giam Hoang, then 23, spoke any English. The congregation rented a six-room flat on Carlisle Avenue for the Hoangs. Giam, an electrician, was hired at Racine Steel Castings, and the family was able to support themselves on Giam’s income after their first month in Racine. They soon moved to a larger home on Tenth Avenue. Five years later, two of Giam’s brothers were pursuing Master degrees in electrical engineering and a third was a senior at UW-Madison. The congregation voted in May, 1980 to purchase a new tracker organ, built by Jeff Hammes and Gary Foxe of Butler, Wisconsin. It was decided to build the new organ in the balcony at the rear of the church, rather than at the side of the church where the previous Wick organ stood; it is a free-standing mechanical action pipe organ with sixteen stops and nineteen ranks, based on designs of 18th Century German organs. The old organ was sold to the Church of the Annunciation (Episcopal) of Waukegan, Illinois, for $3,500, and was removed on July 12, 1982 in anticipation that the new organ would be completed in a week or two. Indeed, the organ’s original completion date was to have been in time for Christmas, 1981, but it wasn’t finished until October, 1982. Carthage College Professor William Roth inaugurated the organ at worship services on October 24. Rev. Carlson left Emmaus in 1982 to serve as pastor of Mt. Carmel Lutheran Church in Milwaukee. He retired from active ministry in 2005. In 1988, the American Lutheran Church merged with the Lutheran Church in America and the American Evangelical Lutheran Church to form the Evangelical Lutheran Church in America, now the largest Lutheran church body in the United States. Pastor Rossing left Emmaus in June, 1993 to serve Our Savior’s Lutheran Church of Hibbing, Minnesota. He retired in 2004. Rev. Mary L. Janz, Emmaus’ first female pastor, was called as an Associate Pastor in 1991, succeeding Rev. Richard Pearson. In 1994, Pastor Mary accepted Emmaus’ call to serve as co-pastor with Rev. Paul J. Nuechterlein. In 1993, Emmaus began opening its doors on Friday nights during the months of October through April as one of seven shelters for the homeless in the city of Racine. The REST program (Racine Emergency Shelter Task force) involved seven host congregations and several other congregations whose members contribute their time and talents in service to people who have no home. REST was folded into the Homeless Assistance Leadership Organization (HALO) in 2005; HALO operates out of a single site on Taylor Avenue and 18th Street. 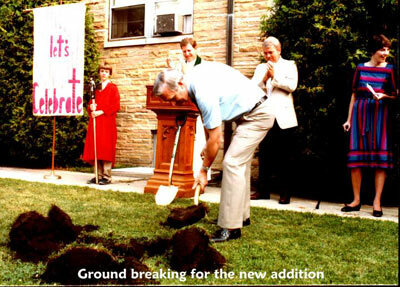 Emmaus celebrated its sesquicentennial in 2001.